Youzi's Balaclavas & Neck Warmer Gaiters. Best gift for your parents, friends, and yourself when the cold weather. Washing Tip: by hand wash below 86℉ water. 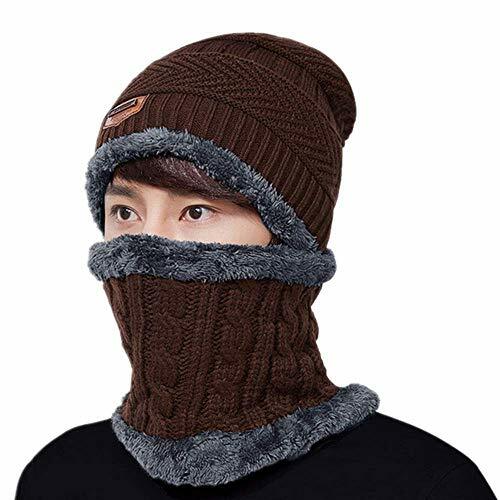 KEEP YOU WARM & SUIT EVERY ACTIVITY - Unisex winter neck face windproof mask balaclava fleece hood, suit all outdoor activity in cold weather. STYLISH & EXPERT DESIGN - Crafted balaclavas fleece Winter hats. When you are walking, fishing, camping, hiking, skiing, cycling and other outdoor activities in cold weather, stay warm without sacrificing any aesthetics. DUAL LAYERS DESIGN & DELICATE SEWING - Beanie Hat Scarf Set Crafted from acrylic knit materials with fleece lining. Make sure you stay warm and comfortable during the cold winter months and provide the added durability. ONE SIZE FITS & INCREDIBLY ELASTIC - This hat can be stretched and unisex style, suitable for almost any shape or size of the head. (size shown in Figure 4). NOTICE - No chemical smell. Please wash it before wearing. Washing Tip: by hand wash below 86℉ water. If you have any questions about this product by YouZi, contact us by completing and submitting the form below. If you are looking for a specif part number, please include it with your message.